Steve Bannon, U.S. President Trump's chief strategist, rightly identified the key importance of two speeches given by the presidents of China and the U.S. earlier this year. By counter posing the two, Bannon himself intended to praise protectionist statements by President Trump against President Xi Jinping's support of globalization: "I think it'd be good if people compare Xi's speech at Davos and President Trump's speech in his inaugural…. You'll see two different world views." Unfortunately for Bannon, most international commentators arrived at the opposite evaluation. Support for Xi's policy approach came from groups well beyond those invariably sympathetic to China. Ian Bremmer, president of the Eurasia Group, the most influential Western "risk analysis" company, for example noted: "Davos reaction to Xi speech: Success on all counts." But while support for Xi Jinping's approach was perhaps to be anticipated internationally, because of its opposition to protectionism, what is not so generally understood is that China's support for globalization is far more in the interests of the U.S. population than is protectionism. Analyzing factually why is therefore this article's focus. U.S. tariffs reduced tire imports from China by 67 percent. As it was a country specific tariff the great majority of Chinese tires were replaced by Mexican, Thai, Indonesian and other imports. Nevertheless, employment in the U.S. tire industry rose by 1,200 - hence President Obama's claim. There were possibly also other indirect losses. China raised tariffs on U.S. chicken part imports soon after U.S. tariffs were imposed on China's tire exports - producing a 90 percent fall in U.S. chicken part exports to China. China officially denied there was any connection between these actions, but many economists point out that retaliation is usually an inevitable part of trade wars. Therefore "U.S. Tire Tariffs: Saving Few Jobs at High Cost" concluded: "The big winners from the 2009 safeguard tariffs were alternative foreign exporters, primarily located in Asia and Mexico, selling low-end tires to the United States. Domestic tire producers were secondary beneficiaries. The members of the labor union that petitioned the ITC's investigation received only a small share of the money extracted from the pockets of American households… Jobs created in the tire manufacturing industry were more than offset by the loss of jobs in the U.S. retail sector. As an added consequence, U.S. chicken firms lost export sales in the wake of Chinese retaliation." It is important to be clear that the $900,000 cost per job "saved" in the tire industry in this case was not some extreme untypical example. Extraordinarily high costs for job "protection" by tariffs are typical as findings have been repeatedly confirmed over a long-time period. A 1986 survey of 31 industries found the cost to consumers per job "saved" in industries with protectionism ranged, in 2016 prices, up to $2.2 million and averaged $516,000. A study in 1994 found that the average cost of protecting a job in the U.S. by tariffs at that time was $275,000 in 2016 prices. The estimated cost of saving a job in the U.S. steel industry in 2001 by tariffs was $490,000 at today's prices. It should be noted that so far only negative effects within the U.S. have been analyzed. But increased costs in the U.S. economy due to tariffs also raise the international cost base of U.S. companies, thereby negatively affecting U.S. exporters. Approximately one in eight U.S. goods and service is exported, therefore the negative domestic effect of U.S. tariffs extends into the international field depressing jobs and wages in U.S. exporting companies. As Mark Perry, University of Michigan professor of finance and economics, noted in an analysis with the self-explanatory title "How Trump's tactics for saving U.S. jobs could kill them instead:" "Trump's attempts to 'bring jobs back to the U.S.' or 'keep jobs from leaving the U.S.' will likely backfire and kill U.S. jobs in the long run." Rick Newman, in an article at Yahoo Finance, analyzed the process whereby this occurred: "Pressuring companies to accept higher production costs, which Trump is essentially doing, could easily backfire and destroy more jobs than if Trump were to do nothing." Specifically analyzing pressure put by President Trump on U.S. air conditioner manufacturer Carrier, Newman noted: "Carrier's competitors include Trane and American Standard, both owned by Ingersoll-Rand, which is based in Dublin, Ireland; Rheem, headquartered in Atlanta; and Goodman, owned by Daikin, a Japanese conglomerate. Each has manufacturing operations all over the world. If any one company has higher costs than another - whether labor, components or anything else - its products will be more expensive than the competition and sales will most likely decline… compared with competitors able to undercut it on price… Businesses bear those higher costs as well, and they'll have less money to hire people if other costs go up." "Further, of those 53 million new jobs some 62 percent of them were in higher paying occupations than those 'high paying good jobs' in manufacturing we lost. Yes, really, 33 million higher paying jobs came along to replace those 7 million lost." 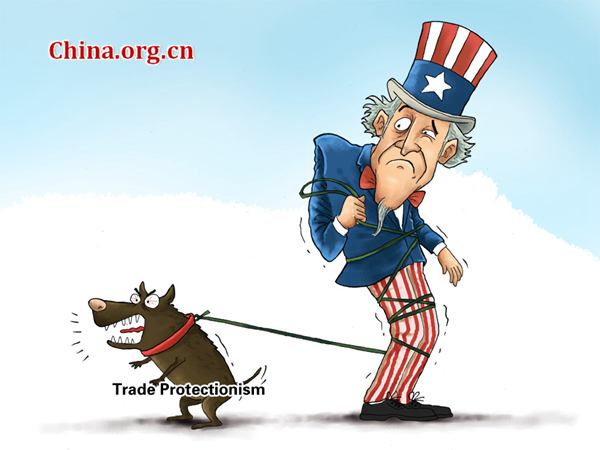 Protectionism against China or other countries directly damages U.S. wages and jobs.